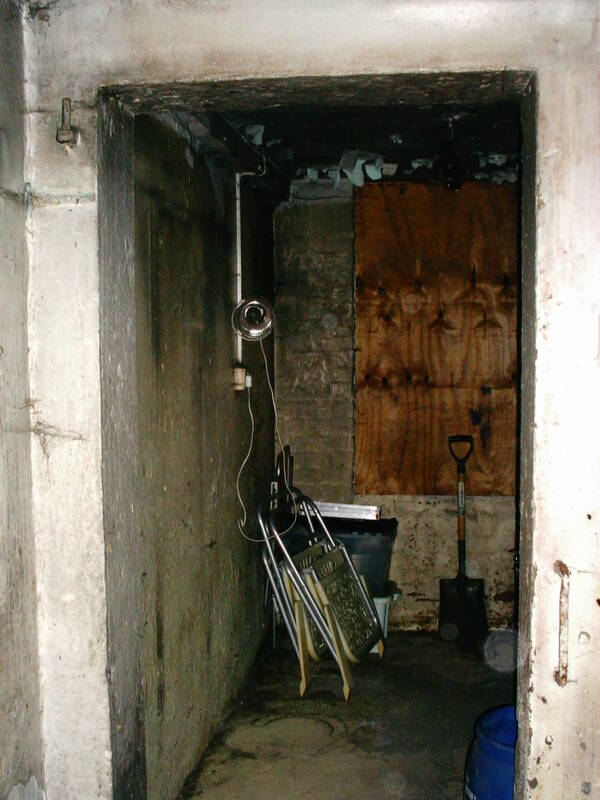 Pictured here in 2004, like the rest of the premises it was dark, damp and mouldy. I couldn’t really keep anything of value in here. Even the light no longer worked because of the water damage. This window had also been boarded up since the burglary, to avoid any further break-ins. We erected a large metal shed in the back yard to store excess bakery equipment. Unfortunately, it was barely up for two weeks before the padlock was smashed off and several items went missing. Stage Lighting and a box of 400 vinyl singles also disappeared. We finally gave up trying to secure it when we went outside one day to find someone had set up home in it! We just told them they could stay for a while so long as they stopped the rest of the stuff from being nicked! Some time after the bakery closed, I needed to clear the back yard of all the rubbish that had accumulated. So I got the scrap metal dealers back in again to demolish it and remove it from site. 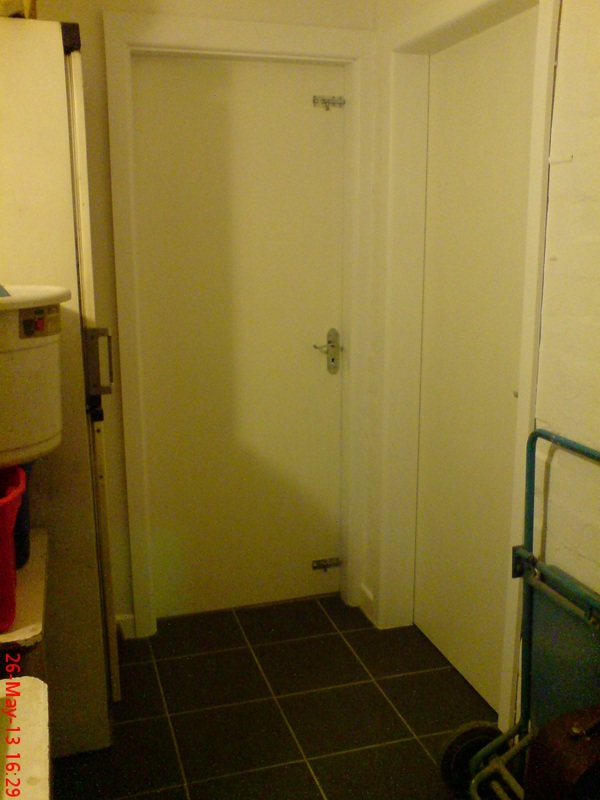 This room didn’t have a door when we operated as a bakery. However you can see the large hinge on the left and that metal bar on the right left over from when it was the original rear door into the building. 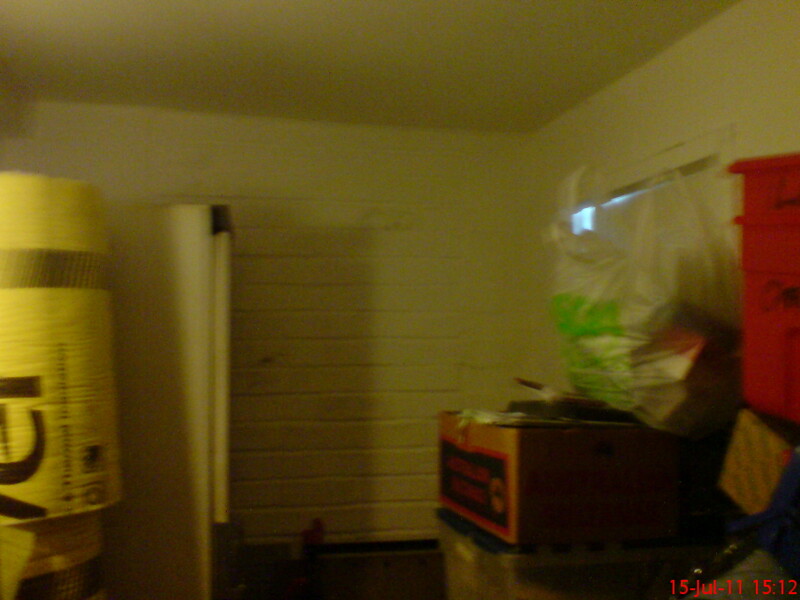 In 2008, whilst the live room was being built, I redecorated the store room and put it into use. I had the old window bricked up when the builders were putting on the new roof etc. I treated it with mould killer and gave it an undercoat of damp-proofing paint, but despite several coats of exterior paint on the brickwork, it still flaked off. At this point I also laid some new wood-effect vinyl floor tiles, but they didn’t really stick to the concrete surface very well. Whilst the room looked a lot nicer and was actually usable, it was still very cold and damp. The walls were built when cavity insulation was not a requirement, so it was just a single layer of bricks between us and the elements! The crunch came when the builders, who used this flat roof to access the lean-to roof, put their feet through it! They repaired the damage, but not to a satisfactory standard, and damp later started to come through the ceiling. The light that you see on the right, is the exit to the back yard. Whizz forward to 2012 and here is the new extention. The original back door on the right is now the new WC. A hole was cut in the rear wall and a new back door has been installed. The new floor tiles really make a big difference. I was originally planning to have them just in the new WC, but they looked so good, I had the builder extend them into the store room area. The new external wall of the WC has been built as a cavity wall, so I had extra insulation added to the only remaining external wall in the store room to keep some of the heat in. Together with a new roof that stretches the whole width of the building, covering the damaged roofs of the store room and ovens, this has made an incredible difference to the habitability of this room. Remember the one and a half rolls of Rockwool I had left over? Well, I used them in the roof cavity. This room is now several degrees warmer than it used to be, and that’s with no heating installed!